The great Miss Sharon Jones was a lover and a fighter. Her spirit was true, her joy was infectious, and her voice will not be forgotten. Sharon's time recording in the House of Soul Studios in Brooklyn with the Dap-Kings was the crowning highlight of the long climb of her career. She'd known, since she found her voice in church at eight years old, that singing was her gift, but it took a long time for the rest of the world to catch up. It took her 40 years to "make it" as a singer, after stints as a corrections officer and an armored car guard. A moonlighting session singer and all-around party-starter with a New York-area cover band, she was told in the '80s that she was too dark and too short for a solo career. Born in James Brown's hometown of Augusta, Georgia on May 4, 1956 (there must have been something in the sweet tea), Sharon grew up in South Carolina and then New York City. A mid-'90s gig singing with Lee Fields and a full soul band matched her up with the fine folks who'd become the core of her musical partners the Dap-Kings: Gabriel Roth (bass), Neal Sugarman (sax), Binky Griptite (guitar), and Fernando Velez (aka Bugaloo, on percussion). Roth and Sugarman founded Daptone Records (Charles Bradley, James Hunter) in 2000, with a clear mission to celebrate funk and soul music. They had their ideal frontwoman in Sharon. But unfortunate setbacks, like Roth's injuries from a car crash, meant there was a stretch of hard work ahead. The first Sharon Jones and the Dap-Kings album came out in 2002, and their Brooklyn studio took until 2003 to open. It was a labor of love; Sharon even hooked up the electric outlets herself. Finally in 2006 and 2007, it all began to gather steam. The Dap-Kings recorded Back to Black with Amy Winehouse and Version with Mark Ronson. They released their own third album, 100 Days, 100 Nights, and their reputation as top-notch live performers began to spread. The band first brought their vintage soul sound to WFUV in 2007, and we fell in love. Performances in New York and at South by Southwest were don't-miss events, full of both joyful sound and booty-shaking exuberance. In a 2010 Studio A visit with Rita Houston for I Learned the Hard Way, Sharon told the story of how she spontaneously came up with a routine unfolding the evolution of soul music through dance: "I was on one night and I started going through (the moves of) my ancestors from West Africa—that's where I get my dancing from, from my ancestors—anyway, they came over, they brought them across the water. And then I met my next set of ancestors, the Native American Indians, and then came me—a combination of both of my ancestors—then I threw the shout in there; that's another part of my dance heritage, I show people how I shout. That all just happened on stage." The next few years of touring and recording would turn out to be high point. Sharon sang on Michael Bublé's 2009 Crazy Love album and for David Byrne and Fatboy Slim's 2010 Here Lies Love project. She performed Exile on Main St. with Phish. The band went back to the studio in 2013 to record Give the People What They Want, but before they could release it, Sharon got a rough diagnosis: Stage II pancreatic cancer. Of course that changed everything. The band took a break and Sharon went into treatment. 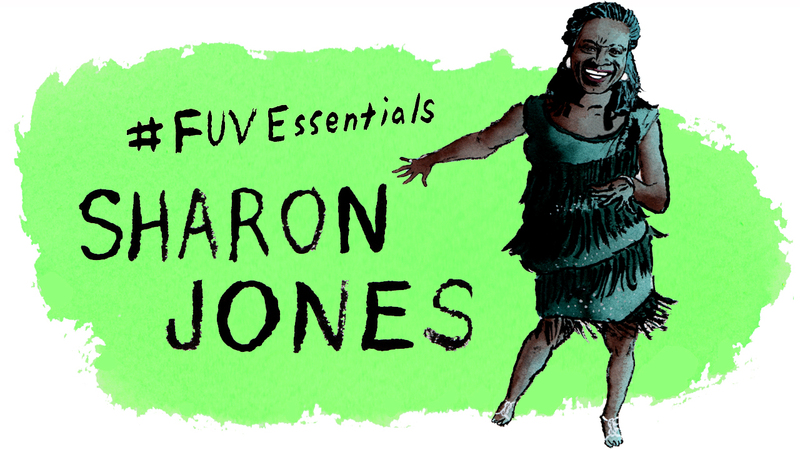 This phase of her life, at first by chance, was recorded by Academy Award-winning filmmaker Barbara Kopple for the documentary "Miss Sharon Jones!," which is a deep and true testament to the love Sharon and the Dap-Kings shared for music and for each other. As Sharon said on "Fresh Air" when the film was released in 2016, "Doing the film was also my therapy, and I knew that it would help someone out there with cancer, or going through it, as long as I inspired someone. That's where my health came from, my energy came from, knowing my fans was out there and I'm getting back to them, and I wanted them to see what I'm going through." She emerged in 2014 to release the album, which was quickly nominated for a Grammy Award, and the band went out on tour. It wasn't easy, but nonetheless, Sharon shone on stage. You can hear the beauty and power in her voice in her performance from the station's Holiday Cheer for FUV benefit concert in 2015 (including a soulful "Silent Night" duet with Brandi Carlile), and in their 2016 BRIC Celebrate Brooklyn! Festival performance, which aired as part of the FUV Live series. The band's 2015 Christmas album, It's a Holiday Soul Party, would be their last released during Jones's lifetime. They had to cancel a European tour when the cancer returned and Sharon went back for more surgery and chemotherapy. Sharon's final visit with us at the radio station was in 2016, talking with Rita Houston as part of a Guest DJ session after Miss Sharon Jones! was released. Wearing a "music heals" T-shirt, Sharon shared with Rita what it felt like to return to the stage after the often grueling treatment. "The music always takes away the pain," she said. Describing what it's like waiting in the wings to go out and perform, she explained, "I'm a bundle of nerves... but I have my ritual. I pray. I ask God to anoint me, anoint my body. I ask him to make me remember the lyrics," she laughs, "and to take the pain out of my feet and out of my body, and I go for it." For Sharon, watching the film gave her the gifts of seeing for herself the effects her struggles had on her beloved band, and of bringing her fans closer to her. "They say how I inspire them to keep on going, but they inspire me. They keep showing me love, and that love keeps me fighting." Sharon Jones died on November 18, 2016, at the age of 60, but no mortal end could ever take her essential spirit from us. She will always be a beloved FUV Essentials artist.